Finally, get rewarded for buying your textbooks and other college merchandise…. eCampus.com is so proud to announce our eCampus.com eWards loyalty program! 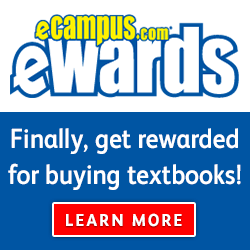 eWards is the ultimate loyalty program for buyers of college textbooks and merchandise. Just like everything on eCampus.com, earning and redeeming eWards for exclusive rewards and VIP benefits is easy, simple and fun. There are two ways to enroll, after a purchase, or via the customer’s eCampus.com account. In fact, just signing up earns members 50 points. Once enrolled, members receive a 5% off deal that they can easily share via Facebook, Twitter, or email. If a friend completes a purchase through the shared link, referral points will be awarded to the original customer. 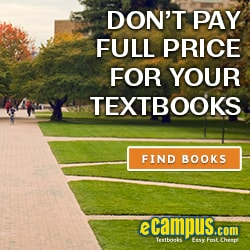 The eCampus.com eWards program lets students use the power of their social network to save money on future textbook purchases. Members can come back to eCampus.com throughout the semester and continue to earn points by simply sharing deals and products to their social network. This way, members collect points throughout the semester that can be used toward next semester’s textbook purchases. In addition to social media and email, members also earn eWards points when buying, renting and selling books and other merchandise – and they can trade in their eWards points to earn rewards and discounts toward shipping and future purchases. After each purchase, members will be awarded badges that they can share with their friends and contacts throughout social media. Badges represent college progression from freshman year to graduate school and beyond. One profitable feature for members is the ability to earn eWards when renting books—two points per dollar. Given that 79% of responders in a recent eCampus.com survey said that they rented their textbooks, earning points from renting could easily become the most popular and lucrative consumer feature. Customers also have a chance to earn both cash and eWards when selling books back to eCampus. eWards members will receive one point per dollar when selling books back to eCampus.com or through the Marketplace, where books are sold to other students. So, what are you waiting for? Join today at www.eCampus.com/ecampus-ewards.asp. We recently revamped our entire college clothing catalog with some pretty awesome NCAA® gear. We have everything from sweatshirts and hats to backpacks and watches for 430 different colleges. 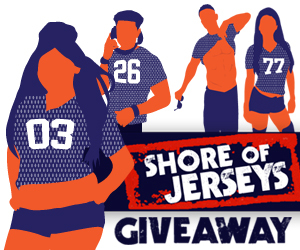 To kick-off fan excitement, we will be launching a weekly giveaway on our Facebook page called the Shore of Jerseys. Every week, from now until the Allstate® BCS National Championship Game on January 9th, we are awarding one lucky winner with a replica football jersey and a $50 gift card from Skinit.com. Invite your friends to join the eCampus.com Shore of Jerseys Giveaway for additional chances to win. If you refer a friend and they are selected as a weekly winner, you will also receive a football jersey and $50 gift card! This promotion is in no way sponsored, endorsed or administered by, or associated with, Facebook, Viacom International, MTV Networks, MTV Channel, 495 Productions, Jersey Shore or their Parent Companies or Affiliates. You understand that you are providing your information to eCampus.com and not to Facebook.